William Blake’s highly individualistic paintings and illuminated books have been a pervasive influence on painting and other arts ever since. The Pre-Raphaelites, particularly the Rossetti brothers, were among Blake’s most devoted followers (after his death), and William Rossetti was an early Blake scholar, cataloguing many of his works. 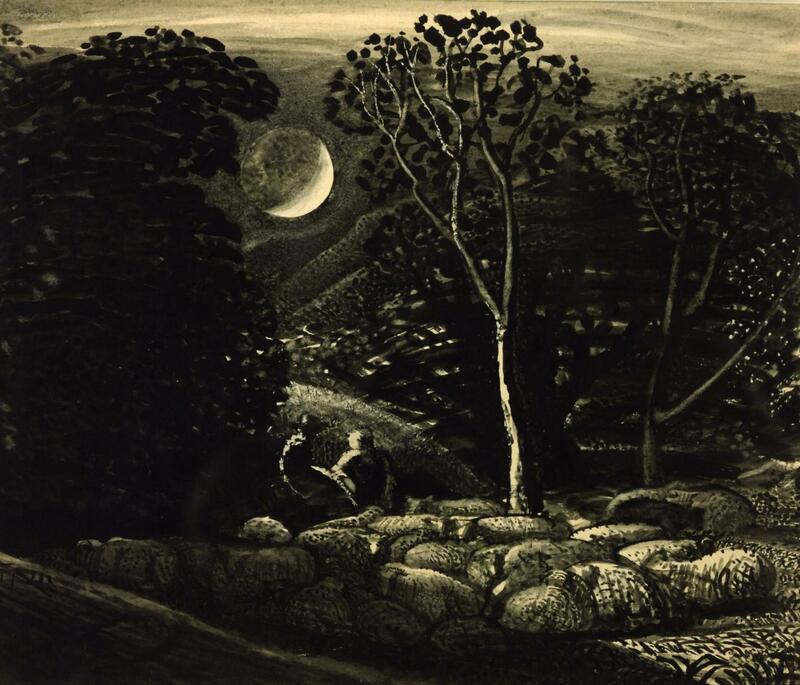 This article is a brief introduction to the paintings of two of Blake’s friends and supporters, who in turn have influenced art well into the twentieth century: John Linnell and Samuel Palmer. Although not well-known today, both were important British painters in the nineteenth century, and creators of many superb paintings in their own right. In 1805, William Blake was commissioned by his loyal patron Thomas Butts to paint a series of twenty-one watercolours showing the story told in the Old Testament Book of Job. In these, he depicted this faithful and pious man undergoing a series of horrors, calamities, and torments at the instigation of Satan, in an attempt to destroy his faith in God. Job does not break, and is eventually restored to health, prosperity, and happiness. William Blake (1757–1827), Job and His Family (c 1805-6), pen and watercolour on paper, 22.5 x 27.4 cm, The Pierpont Morgan Library, New York, NY. Wikimedia Commons. Job and His Family is Blake’s opening painting for the series, from about 1805-6, and shows Job, his wife and family stood in prayer around an old oak tree, before the awful events were brought upon him. 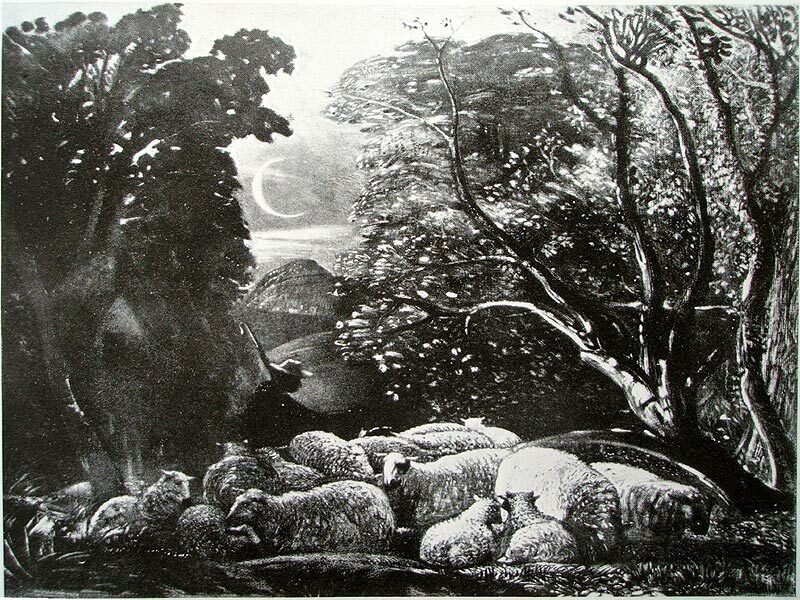 The family is surrounded by sheep in a pastoral landscape, the sun setting at the left, and a thin crescent moon at the right. Musical instruments hang in the lower branches of the tree, and a traditional English country town is seen in the background at the left. John Linnell was by no means an affluent artist, but when he got to know Blake really well in 1820-21, he was determined to bring him some relief from his desperate poverty. He saw an opportunity in Blake’s work, in particular the set of paintings of the Book of Job. From about 1821, Blake painted a second complete set for Linnell, and in 1823, Linnell and Blake signed an agreement under which Blake would engrave them for a fee of £100, plus a further £100 from any profits resulting from their printing and sale. 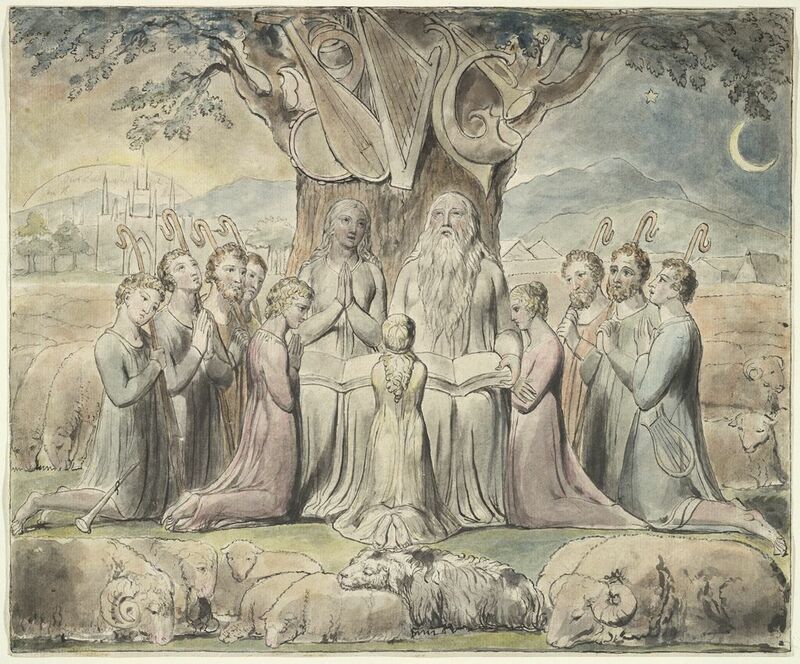 William Blake (1757–1827), There Was a Man in the Land of Uz (The Book of Job) (Job and his Family) (1821), watercolor, black ink and graphite on cream laid paper, 22.8 x 27.4 cm, Harvard Art Museums/Fogg Museum (Bequest of Grenville L. Winthrop), Cambridge, MA. Courtesy of Harvard Art Museums. 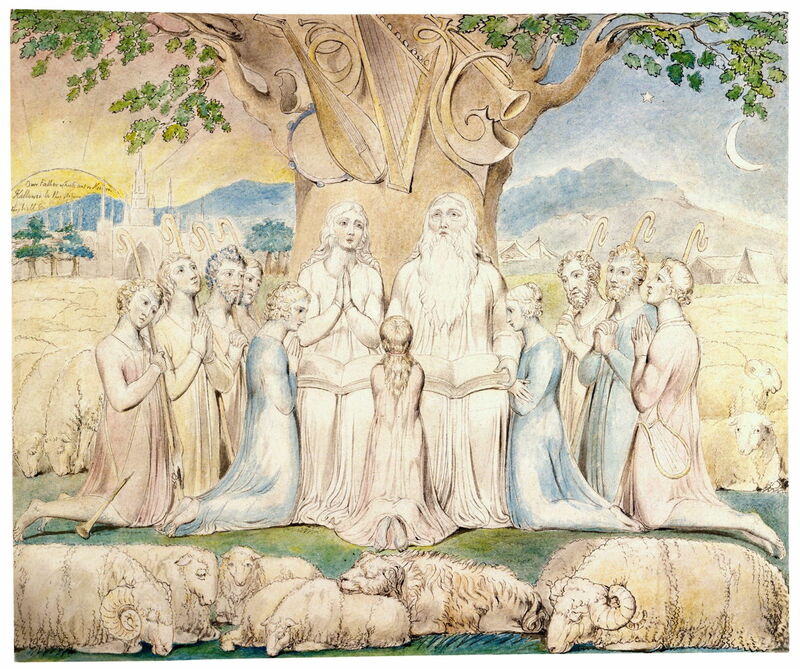 There Was a Man in the Land of Uz is the equivalent watercolour which Blake painted for Linnell in 1821, with few and minor changes from that in the set owned by Thomas Butts, such as the family kneeling rather than standing in prayer. William Blake (1757–1827), Plate 2 of The Book of Job (Proof print) (1825-6), engraved print, 18.3 x 14.3 cm, The British Museum, London. Courtesy of and © Trustees of the British Museum. 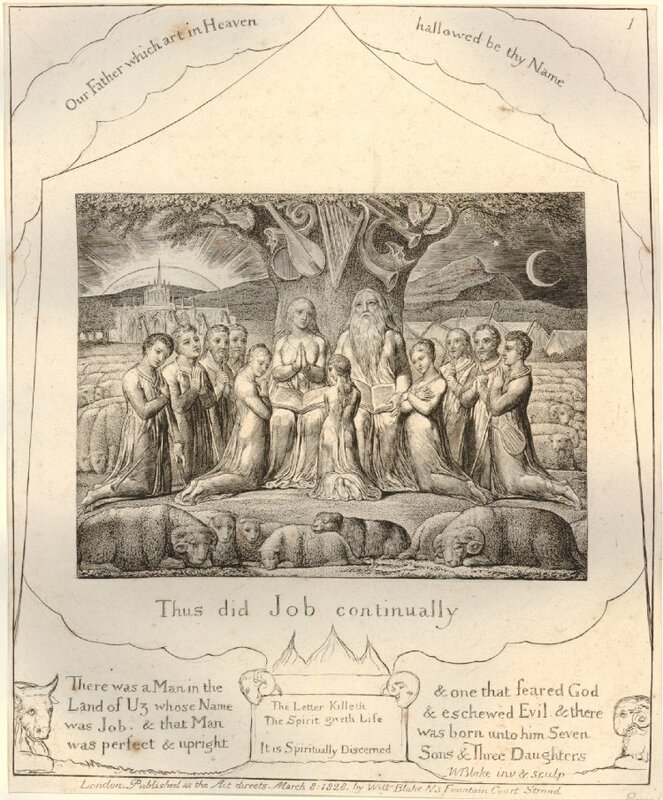 This became the second plate of The Book of Job when printed in 1825-6. John Linnell (1792–1882) not only supported William Blake in his later years, but also introduced promising young artists to him, including several who went on to form the Ancients, a group with aims similar to those of the later Pre-Raphaelite Brotherhood. John Linnell (1792–1882), Noah: The Eve of the Deluge (1848), oil on canvas, dimensions not known, Cleveland Museum of Art, Cleveland, OH. By Wmpearl, via Wikimedia Commons. 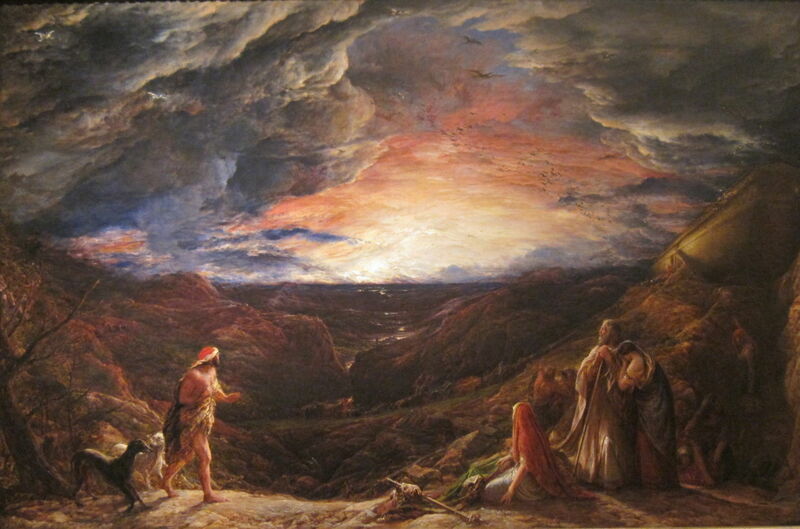 Linnell’s paintings show subtle Blakean influences, such as in his Noah: The Eve of the Deluge (1848). John Linnell (1792–1882), The Sheep Drive (1863), oil on canvas, 99.7 × 71.2 cm, Birmingham Museum and Art Gallery, Birmingham, England. Wikimedia Commons. Several show common themes and style with Palmer and the Ancients, such as this rich golden pastoral, The Sheep Drive (1863). Samuel Palmer (1805–1881) first met Linnell in 1822 when he was still a student, and Palmer first met Blake in 1824, when the latter was working on his illustrations to Dante’s Divine Comedy, and the engravings for the Book of Job. Blake and Palmer became good friends and enjoyed many discussions together before Palmer’s career moved on, and Blake became more frail and then died. Blake’s influence in Palmer’s work is more obvious, and appears decisive in his style. In 1825, Palmer painted six signal landscapes known now as the Oxford Sepias, which are in the Ashmolean. Of these, the composition of The Skirts of a Wood (1825) echoes Blake’s Job and His Family from the Book of Job. Others in the series also borrow from Blake. Between 1826-35, Palmer lived and painted in the village of Shoreham, Kent, a formative period in the development of his art. 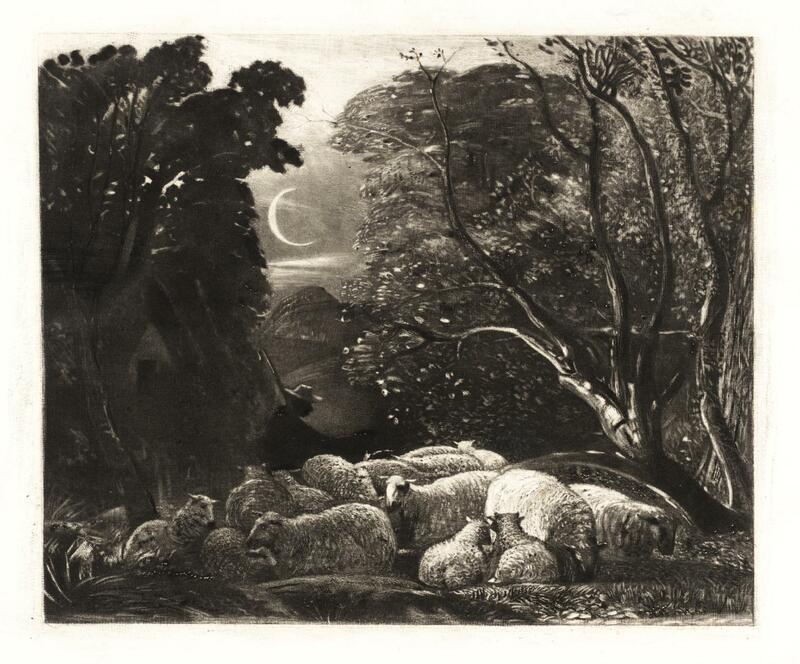 Moonlight, a Landscape with Sheep is taken from one of his Shoreham sketchbooks, from around 1831-33, and progresses from Job and His Family to explore an enchanted rolling countryside which became characteristic of many of Palmer’s best paintings. Samuel Palmer (1805–1881), [landscape study from Shoreham sketchbook] (c 1831-32), ink on paper, dimensions not known, location not known. Wikimedia Commons. This is another related landscape study from Palmer’s Shoreham sketchbooks of the same period (c 1831-32). When engraved by Welby Sherman, it became the beautiful and placid Evening (1834), repeating the process which Blake’s Book of Job had undergone into engravings. Unlike Blake, Palmer did not avoid using oil paint, although many of his early works used water-based media. 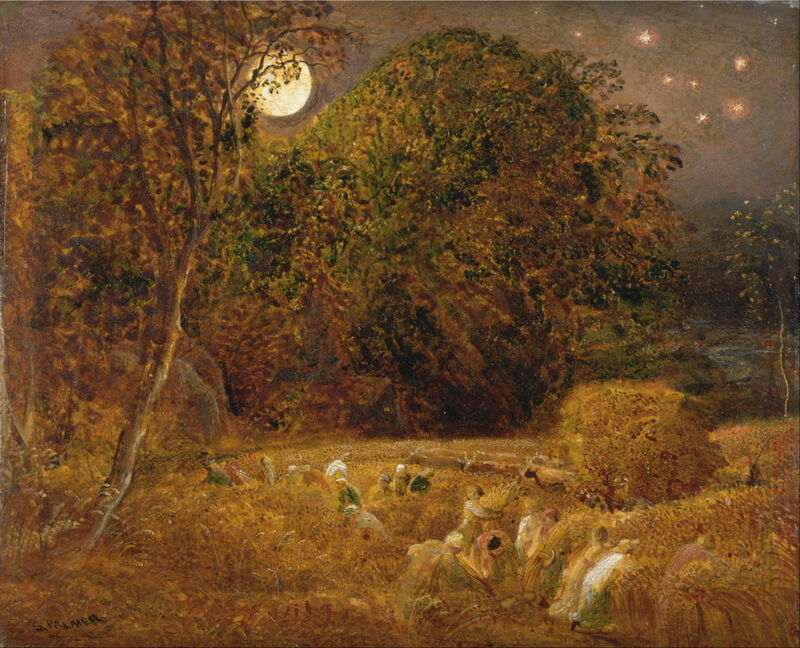 The Harvest Moon (c 1833) was also painted at Shoreham, and shows a team of mainly women cutting corn by moonlight, stacking the sheaves on the wagon seen at the right. Its soft light, night sky, and rich golds and greens create a strong feeling of enchantment and eternity. Oak Trees, Lullingstone Park (1828) is a very detailed watercolour study from earlier in Palmer’s Shoreham years. 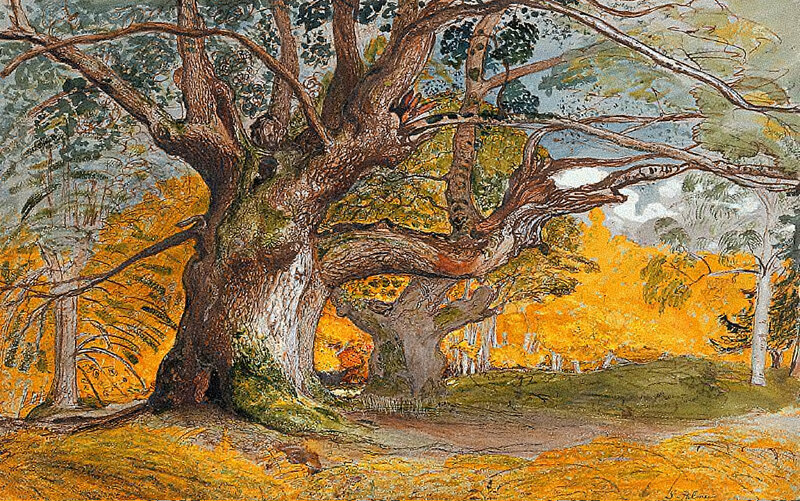 Painted the year after Blake’s death, perhaps Palmer could see Job and his family in prayer at the foot of this ancient oak. Samuel Palmer (1805–1881), Rustic Contentment (date not known), watercolor and gouache on medium, cream, slightly textured wove paper, 18.4 x 40 cm, Yale Center for British Art, New Haven, CT. Wikimedia Commons. 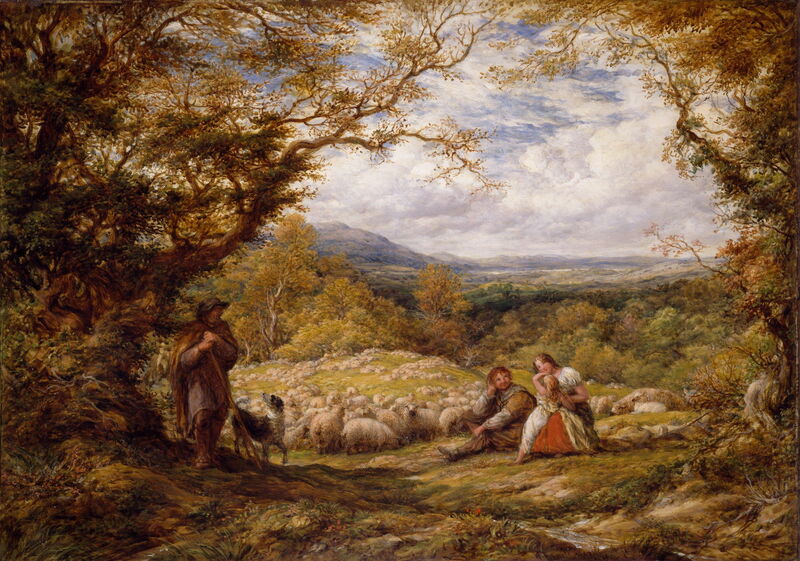 Palmer’s watercolour Rustic Contentment reworks some of the elements in Job and His Family, with a small group sat under an old oak, by the flock of sheep which they are tending. It lacks the magical night light of those harvest fields in Kent, though. After the Pre-Raphaelites, Blake’s and Palmer’s influences extend to the likes of Paul Nash, Graham Sutherland, John Piper, and even Maurice Sendak. My favourite, though, is Eric Ravilious, many of whose paintings were set in similar chalk downland in the south-east of England, and who admitted to being moved by Palmer’s enchanted countryside. Thanks, of course, to William Blake. Linnell, David (1994) Blake, Palmer, Linnell & Co., The Life of John Linnell, Book Guild. ISBN 978 0 8633 2917 3. Posted in General, Painting and tagged Blake, landscape, Linnell, Nash, painting, Palmer, Piper, Pre-Raphaelite, Ravilious, Rossetti, Sendak, Sutherland. Bookmark the permalink.